Combining a captivating romance with a cast of all-too-human characters, Colleen Hoover’s It Ends With Us is an unforgettable tale of love that comes at the ultimate price. Colleen Hoover is the #1 New York Times bestselling author of Slammed, Point of Retreat, This Girl, Hopeless, Losing Hope, Finding Cinderella, Maybe Someday, Maybe Not, Ugly Love, Confess, November 9, It Ends with Us, and Without Merit. She has won the Goodreads Choice Award for Best Romance three years in a row—for Confess (2015), It Ends with Us (2016), and Without Merit (2017). Confess was adapted into a seven-episode online series. In 2015, Colleen and her family founded The Bookworm Box, a bookstore and monthly subscription service offering signed novels donated by authors. All profits are given to various charities each month to help those in need. Colleen lives in Texas with her husband and their three boys. Visit ColleenHoover.com. "Colleen Hoover reminds readers that love is a fragile thing, built from courage, hope, and tears. Every person with a heartbeat should read this book." "It Ends with Us isn't an ordinary love story. It will break your heart while filling you with hope, and by the end of this gripping, pulse-pounding novel, you'll be smiling through your tears." "It Ends With Us is a brave and heartbreaking novel that digs its claws into you and doesn't let go, long after you've finished it. No one delivers an emotional read like Colleen Hoover." "What a glorious and touching read, a forever keeper. The kind of book that gets handed down." "Fans of Hoover's emotional stories, conflicted characters and intense romances will gleefully devour her new novel. If you're a Hoover newbie, this is a great place to start. 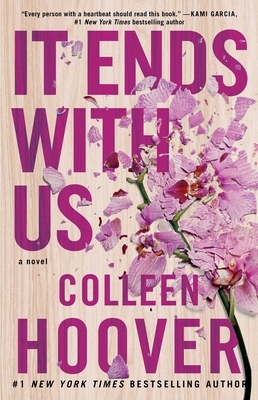 It Ends with Us is a perfect example of the author's writing chops and her ability to weave together uplifting, romantic and somber plotlines. No matter your level of fandom, readers will love and respect protagonist Lily and learn something from her struggles." "tackles tough subject matter with a deft and confident hand"
Colleen Hoover may have written her best novel yet. Hoover's latest novel, It Ends With Us---is a heartrending and powerful exploration of the different sides of domestic abuse. It is one of the most honest and inclusive novels written about the issue that I have ever read. It was an emotional rollercoaster that kept me reading past my bedtime.